It's the latest of a long, almost constant line of coronal holes which have opened up in our sun's atmosphere this year but none of them has been as big as this one. NASA's Solar Dynamics Observatory is monitoring a structure, which stretches more than 700,000 km from the sun's north pole to its equator. 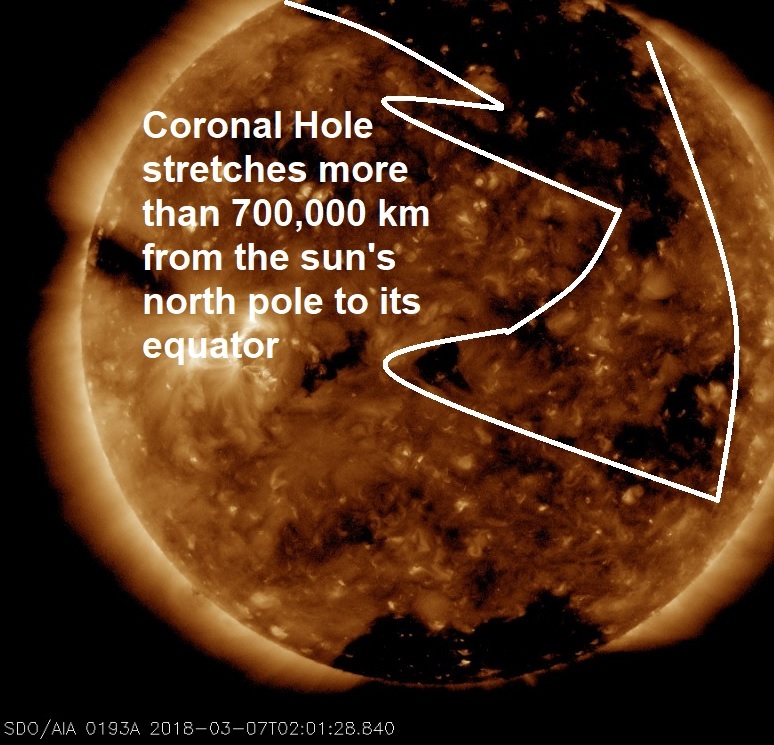 According to Spaceweather.com, this is a "coronal hole"--a region where the sun's magnetic field opens up and allows solar wind to escape. Gaseous material flowing from this hole is expected to reach our planet during the second half of March 8th, possibly sparking Arctic auroras on March 8th and 9th. NOAA forecasters estimate a 45% chance of minor G1-class. It's worth noting, of the 25 major quakes reported this year, 24 of them have occurred during coronal activity on the sun, it's hard to prove a connection between major quakes and coronal holes but in my humble opinion the statistics speak for themselves. It would be churlish not to expect more large quakes in the coming days, stay tuned. One of these days a CME is going to take out a large swath of planet earth.